The pilot (my cousin), Chris Lammert started paragliding since 2002. In 2007, he went to South Korea to take up a certified course from Jonathan Paragliding School under FAI. The course took one month. In 2010, he got his certification from MSAF in T2 (tandem). He is also a certified para-motor pilot, and also AFF certified Base Jumper. He started full time being a tandem pilot since 2014. Chris told me the most wonderful moment to fly is during the approaching sunset. But this is rare because you need a lot of luck to have this opportunity. You need a right wind speed and direction, good thermal and dynamic and of course perfect weather. On few occasions, Chris get this opportunity to bring couples gliding into this romantic scene as the sun goes down and the sky turned red and orange. 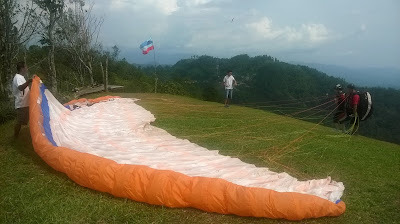 The paragliders preferred location is at Kokol Hill Take-Off Base, about 2800 feet above sea level. It is only about 35 minutes drive from the Jesselton (Kota Kinabalu) city center and the views from up here is awesome because you could see the whole city of Jesselton and also the wide South China Sea. It takes about 10 minutes to walk from the nearest road to reach this place. Walking inside the jungle is also a unique experience especially for tourists. Yes, we should choose good and experienced paragliding trainer for paragliding. Some people died for not experienced paragliding trainer. Paragliding is one of the most popular for entertainment among tourists. I had gone to Tenerife for travelling. 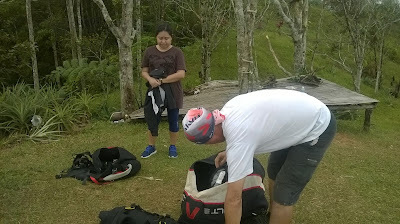 I enjoyed Paragliding with safely. The trainers of Skyparafly helped me for this. They have so much experience. Fully agree with you Sofia Jones. Safety first before pleasure. Thanks for your feedback.